Still Time to Sign-up for PVM’s 2017 Dr. Skip Jackson Dog Jog! Don't miss out on the 2017 Dr. 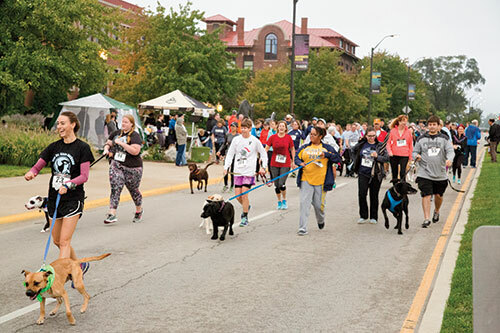 Skip Jackson Dog Jog, which is now just two-weeks away! Act now to secure your spot and make sure you get your t-shirt and bandana for your registered furry friend (dogs not required to participate, but are welcome)! Last year, the event attracted nearly 250 runners, along with more than 100 canine companions. This year's event will take place Saturday, September 23, with the starting line positioned in front of Lynn Hall. Click here to register online. The dog jog also provides many volunteer opportunities, and the student organizers need all the help they can get! Volunteers are a huge part of making this event such a success and your help will be greatly appreciated. To volunteer, click here for the Dog Jog Volunteer Sign-up. Specific tasks will be assigned closer to the day of the event. Contact Asia Fernandes, of the DVM Class of 2020, at fernan95@purdue.edu with any questions. The event is named in honor of Dr. Horace (Skip) Jackson, professor emeritus of veterinary physiology and biochemistry, and is one of the longest-running traditions of the Purdue Veterinary Conference.